Apple is planning to open a retail store in the historic MacArthur Chambers building in Brisbane, Australia, according to a new report. MacTalk reports that an application filed on Friday with the Brisbane City Council to renovate the MacArthur Chambers building hints at an upcoming Apple retail store. The 1930s era building was used by U.S. general Douglas MacArthur as the allied forces' South West Pacific Area headquarters during World War II. According to the development application, the project hopes to "create a high quality retail outlet which showcases the architectural qualities of the original Assurance Chamber and adds contemporary elements of comparable quality." The resulting retail store, which would be Apple's eleventh store in Australia, would encompass the ground floor, mezzanine and basement and involve restorations to the heritage building. Though Apple is not specifically mentioned on the application, the report notes that architectural drawings of the proposed renovation include "recognizable hallmarks of Apple's retail style." "Areas for the Genius Bar, Kids Corner and iPod and iPhone accessories can be found alongside Apple's trademark sugarmaple tables and characteristic stools," the report noted. Other hints that Apple will be the tenant include plans for "a uniform stone floor finish," "new feature stairs," and three equidistant wall-mounted displays behind a long bar with stools. The renovation would reportedly cost as much as $11.4 million, with $3.84 million alone in demolition costs to remove the existing renovations, which were built in the 1980s and revamped in 2001. 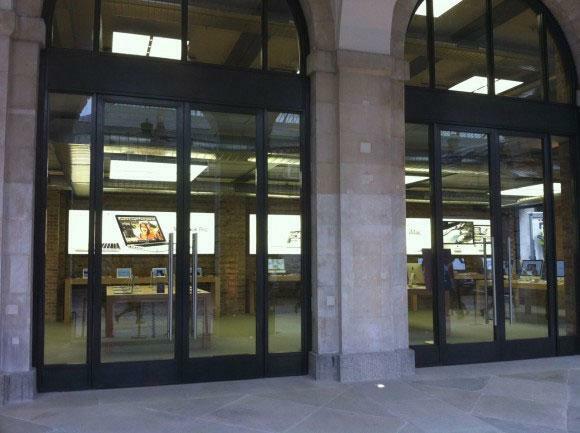 Apple has pursued a restoration strategy in several other heritage buildings, such as the Covent Garden store in London (pictured below) and a store located near the Paris Opera House.